Baltimore & Ohio baggage car No. 633 was built by Bethlehem Car Co. in 1925 and was used in passenger service service through the 1960s hauling baggage, sorted mail, and express. The car has an inside length of 70 feet, and is a B&O class B8-b car with a capacity of 50,000 lbs. (25 tons). 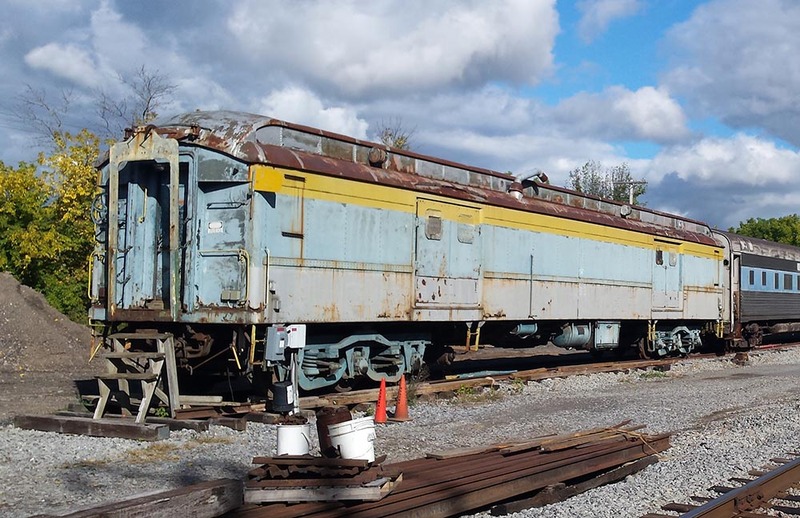 Known to our museum volunteers as “the Tool Car” for many years, our Baltimore & Ohio baggage car was one of the first pieces of rolling stock acquired by the Rochester Chapter NRHS (now R&GV Railroad Museum). With the reduction in passenger service and the retirement of older prewar heavyweight cars, B&O No. 663 was transferred into company service. It was being used for storage when the car was sold to Chris Kingsley in 1971. His plans to covert the car into a private residence fell through, and the car was donated to the Rochester Chapter in 1977. 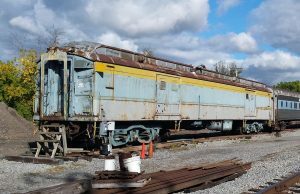 Since our future museum site at Industry was not prepared to accept the car, it was stored at the General Railway Signal facility in Rochester, later moved to Pfaudler Co.’s siding in 1978. In 1979 the car was moved again to a siding in Henrietta. When our museum volunteers replaced the switch from Conrail’s Avon Industrial Track to our siding at Industry, B&O No. 633 finally arrived on August 15, 1981. The car was moved to Track 1 at Industry and was outfitted as our tool and workshop car. The cramped quarters housed a variety of tools and workbench space for a variety of departments to use. Until we constructed the Restoration Building in 1996, we had no other workshop space under cover. On December 6, 2008, the car was moved for the first time in 27 years to its new home on the newly constructed siding on the west side of the LA&L mainline. We plan to use this car as a support and storage space for our excursion set of former New York Central coaches. One of our long-term goals has been to restore the car to its early dark blue and gray “Royal Blue” paint scheme. This car is currently not accessible to the public, but can be easily viewed from our museum grounds at Industry.